Although SAP provides pretty useful Eclipse plugins for SAPUI5 / OpenUI5 development, it still doesn’t help you write better, efficient, correct code. JetBrains WebStorm actually does all that: it is aware of your code, it does a good job at inspecting and analyzing your code, and has terrific support for other HTML5/CSS related stuff (for instance, it does refactoring across multiple file types such as *.js and *.css). And if you add JsDoc comments to your code, you even benefit from proper type checking! You really have to try it to believe it. And once you complete the steps described in this blog, you will benefit from excellent UI5 coding support as well! Here you see the WebStorm IDE with a MyView.controller.js file in the active editor tab. In the onInit() method, a variable oView is defined, and as you can see, the code completion is fully aware that within the controller ‘this.getView()‘ is 1) a reference to the controller’s view, 2) that it’s of type sap.ui.core.mvc.View, and 3) provides access to the view’s methods and events. In addition, it shows the onInit() function and oView variable as ‘unused’, making it easy to find redundant code. No other IDE I know of does this so perfectly and blazingly fast as WebStorm! WebStorm isn’t Open Source like Eclipse, but a personal license costs a mere 44 EUR and as such is worth it every penny. Unfortunately, it currently has no support yet from SAP or the Open Source community for UI5, but according to some of the topics on SCN and Stackoverflow regarding UI5 development with WebStorm, it seems quite in demand. This blog tries to fill the gap and help you set up WebStorm for use with UI5 development. In order to use XML validation and code completion when using XML Views, we need the XML definition for the UI5 libraries. For reasons unknown, these definitions aren’t included in the OpenUI5 download, but they are included in the UI5 plugin for Eclipse. So we need to have Eclipse installed with the UI5 plugin. After you have installed WebStorm, we need to make it OpenUI5-aware. First, we include the UI5 libraries. Since I mainly use the sap.ui.core and sap.m libraries, I will use these now as well. If you need other libraries, you can include these in the same way. Open WebStorm, and from the ‘Welcome to WebStorm’ screen, select ‘Configure > Preferences’. In the dialog, specify a name and version, and set ‘Visibility’ to ‘Global’. Repeat steps 4. and 5. for file “./resources/sap/m/library-all-dbg.js”. Both files are now listed in the ‘New Library’ list, and you can click ‘OK’ to save our just configured ‘OpenUI5’ library. Now, we need to add the XML definitions for use with XML Views. First, we need to copy the XML definitions from our Eclipse UI5 plugin. Navigate to your Eclipse ./plugins folder. Locate both ‘com.sap.ui5.core_n.nn.n.jar’ and ‘com.sap.ui5.mobile_n.nn.n.jar’ files, and extract their content. From the extracted content, navigate to the ./libraries folder and copy the *.xsd file to a different directory on your computer. Do this for both the core and mobile libraries. In WebStorm, from the ‘Template Project Settings’, select ‘Schema’s and DTDs’. Under ‘External Schemas and DTDs’ click the ‘+’ button. Do the same for sap.m.xsd, with URI ‘sap.m’. Both XSD’s are now listed under ‘External Schemas and DTDs’. Click ‘OK’ to apply the changes to the preferences, and you’re back at the Welcome screen. Now it’s time to see if what we have configured is actually working and useful. As you can see in the above screenshot, our globally defined library ‘OpenUI5’ is linked as well. Awesome! And even here, as shown in the image you see the references to the unused namespace declarations ‘mvc’ and ‘html’ shown strikethrough. This is just the basics of making WebStorm UI5 aware, and I’m all ears for any other methods or additional configuration to make UI5 development as easy and streamlined as possible! I have the following video “WebStorm 8: Mastering AngularJS, spy-js, Grunt, and Multi-Selection Workflows” on high rotation, to say WebStorm plays nicely with AngularJS is an understatement, cant wait for some UI5 interoperability. Outstanding post Robin – thanks for sharing! Thanks for a great post Robin. It’s great to see examples of different tools used in UI5 development. thx for this excellent blog. I’ve tried it but the ui5 librairies are not in the left panel by opening an new project. Any idea? Is the reason maybe the trial version of Webstorm? Which version of WebStorm are you using? I’ve tried to disabled now the “Enabled-Button” and re-activate it but it’s not possible. And than I’m not allowed to enabled the library. Can you maybe try removing and adding a new OpenUI5 JS library definition? Maybe something else should be setup? Any idea? I would love to work with the XML views code completion and other features of WS. Has anybody else tried to install it? I got it working with a trial version of WebStorm and the same versions of UI5 & DTD you highlighted. I didn’t do anything different from Robin’s steps and was also a fresh install (Mac OSX). Could it be your IntelliJ and WebStorm installation (or maybe an IntelliJ project opened in WebStorm) is causing the problems you see? no I don’t have any other JetBrains products installed. Really strange. I’ve opened a ticket by JetBrains Support to have more information about it. Hi Matthieu, I was wondering did you already got some feedback from JetBrains support? I’ve just re-installed everything and it works!!! Don’t ask me why… No idea. Great post Robin. Thanks for detailing that config for getting the xml definitions. I agree with you that when it comes to web development, developers aren’t going to come to the toolset in the way that SAP have been used to dictating (se80, se38, se24 etc) but web developers are going to have their own muscle memory with sublime or atom or webstorm and won’t want to be forced to move to eclipse. Thanks again for a great blog and for introducing the community to Webstorm. This is behind a paywall but at $9/mo it is worth the look and there is a couple of great series there on OO architecture. Thanks for your comment Nigel! I think outside the SAP realm WebStorm has grown to (one of) the most used IDE for front-end development, but is hardly unknown of in the SAP world. Thanks for sharing these webcasts! It just taught me about ⇧⌘A, for quickly searching an action, which has instantly become my favorite WebStorm shortcut! Thanks again! I was already using WebStorm since version 7 for SAPUI5. It works just fine. Including the XML definitions is a nice idea, haven’t thought about this yet. An integration to SAP NWDI would be great, but this will only work in Eclipse, I suppose. did you find a better solution to integrate with Abap Repository instead of a manual switch to Eclipse? is there a way to run the App directly from WebStorm to chrome? Like we can do it in Eclipse. Sure! If you have an editor with your index.html open, move your mouse towards the top right corner of the editor, and there you will see a popup with (in my case) the option to open the page in Safari, Chrome, Opera and Firefox. Congrats! This post is very useful! I use PhpStorm instead WebStorm, but it works for both. Just the menus are a bit different. Nice info , I was searching for a tool like this which can make the development lot faster and easy. It is not opensource and requires a licence . You need to go through some initial configuration to set it up. You can see the changes simultaneously and can know what you are working will give result. You can find better ways of development as you can see all the exposed variables and available contents. It’s console !!! So you can not test every operations. it takes more time in coding . Let me know if you want to give this way of development in UI5 a try , can explain them in a blog , have come up with own style of writing code in console which makes development for me much more faster . Thanks for your insights! To be true, I myself am not very fond of ‘development’ using the debugger, since it encourages a more or less “trial and error” approach to coding, instead of having a thorough understanding of what you’re actually coding. Furthermore, you can’t create new files in the debugger, and creating valid XML views is not possible either. With a proper IDE, you will also know what will work and give a result, and you will know which variables are available in a certain context, and you will have the added benefit of JSLint / JSHint for checking / validating your code for correctness, something the debugger will never tell you. Having said that, please do write that blog! I’m sure we (I) could learn from your approach as well! I’m working at SAP and actually using WebStorm too 🙂 I fully share your thoughts on Eclipse and it was relatively easy to convince my whole team to switch to WebStorm, so there’s hope 😉 . We’re using it for application development on HANA XS (with regi) and UI5. Hope to see the XSD’s make it to the SAPUI5/OpenUI5 SDK anytime soon! have you any ideas how to submit code to SAP for deployment, other than the SAPUI5 ABAP Repository Team Provider? Because you need Windows and Eclipse for that workflow as far as I know. We still investigate the possibilites to deploy UI5 applications, and I’m not really happy with Eclipse and we use PHPStorm for other web development anyway. You could use report /UI5/UI5_REPOSITORY_LOAD to do that. It should be self-explanatory. I’m no ABAP and SAP dev, so I have only basic knowledge of the processes behind report names. How would you take advantage of this report? Call it from SE37 and link it to my source folder? the application I work on gets only deployed to the HANA repository and so I probably can’t give you too much helpfuls insights into alternatives to the ABAP repo provider. If the mentioned report is web-based, perhaps you could write a grunt / gulp task which fires an http post request against the endpoint being used by the report and attach the file contents as payload. Since you explicitly mentioned Windows as a concern, I assume you’re developing on mac / linux. In this case I would suggest to run a windows VM in the background with eclipse installed. Using Synced / Shared Folders (VirtualBox / VMware fusion etc.) you could open the same directory in Eclipse on the guest VM and in PHPStorm on your host. For deployment you would then have to switch into the VM and click a few buttons in eclipse. To ease this workflow you can install a plugin (I think it’s called AutoSave or AutoReload) in eclipse, so that eclipse refreshes the file system changes automatically when it gets focus – similary to PHPStorm. I know it’s a hack, but let’s be pragmatic. There’s raised awareness within sap, that tools should rather be IDE / OS independent, so I’m optimistic there will be more command line tools etc. in the future. I also had a similar problem in the past, since to deploy to the hana repo I have to use regi (command line tool) which only runs on windows and linux, but my machine is a mac. To ‘solve’ it I’m running a linux vm with regi in the background, which takes care of the deployment. I’ve automated the setup of the VM using Vagrant, so that other colleagues can benefit from it. I’ve also written a small shell script for my mac which automatically connects via ssh to the guest VM and virtually let it appear as if regi is installed ‘natively’ on OS X, even though it isn’t. Initially I used the aforementioned Eclipse / Webstorm shared folder setup, which worked well too – only disadvantage was that I had to switch the context for deployment and press a few UI buttons, instead of typing terminal commands. very good write up. I’ll take everything into consideration. Just one more bit of info, we are currently in a “learning phase”, and for tests we want to use our development SAP to host the applications. Whereas on the customer side it’s planned to use the “Front-End Server” approach. Hana comes into consideration later. Is there much difference between a Hana and SAP repo? Regarding the differences between the HANA and ABAP Repo probably Maximilian Lenkeit can elaborate a bit more in detail. I assume if you’re only developing UI code the differences are not that big – it’s basically different deployment targets and deployment tools. * heavily use of the sapui5 MockServer functionality (mocks http requests in your client, so you don’t rely on a backend). * use a local development server which serves the ui artifacts from your local file system and proxies through the requests which have to be sent to backend. Dev servers I know which support this are (there are more…): webpack-dev-server, connect, browsersync and also karma (karma is just for testing, but it’s integrated web-server can also proxy stuff during the tests). Also I would recommend using git or mercurial for version control and using the hana repo / abap repo just as deployment target (at least for the UI code). The app I work on is hosted on our internal GitHub Enterprise for example. Regarding SAPUI5 deployment, I’m not aware of any significant differences between e.g. deploying to HANA or deploying to NetWeaver. In both cases, you would probably upload your UI5 coding to a dev system (either HANA Studio/Regi for HANA or ABAP Team Provider/Report for NetWeaver) and then transport your coding to subsequent systems. The only difference when it comes to coding is probably the path to the sap-ui-core.js file that you’re usually referencing in your index.html. It’s usually /resources/sap-ui-core.js but on HANA, I believe it’s /sapui5/resources/sap-ui-core.js. Also, the remarks from Christian Theilemann are probably a good starting point. Will definitely try webStrome ,as promised i have reviewed few of the chrome development tools which , the console can act as a good playground for analyzing and preparing the code but as you said we can not use it for complete development. I am following this guide for the first time but not getting code-completion to work. I downloaded the openui5 sdk from OpenUI5 – Download and the version is 1.26.7 (2015-02-16). Could that be the reason or what else to check? Are you talking about code completion in webstorm or Eclipse? If it’s regarding webstorm – the plugin version is not that important. Also the 1.25.5 and 1.26.4 plugin jars contain the .xsd files. If you have problems to configure webstorm accordingly you can simply copy the .xsd files into your project folder (e.g. into lib/ui5xml ). Webstorm will automatically index them without any further configuration. Imho I’m also doing it that way to save my colleagues from manual configuration. Webstorm of course, 9.0, and it works now. It seems for the first time the IDE needs some time, but now is ok. Is there a repository to fetch the XML definitions, without installing eclipse, finding and unpacking plugin jars ? Thanks for this helpful guide. And hopefully SAPUI5 SDK will follow soon! Should hopefully keep us going until the UI5 team include the files in the non-Eclipse download! Than you John, that really helps and hope to be bundled with UI5 soon. Is there a way to configure the default resources folder so that when I run the project the openui5 directory is loaded into the web server? I’m using the WebStorm test server. The SAP WebIDE is so great it automatically sets the proxy server and all the resources 🙂 . Hi Joao. I think what you’re referring to is a configurable url / folder remapping of the paths in webstorms integrated webserver. Unfortunately this is not yet supported and it’s also somewhere mentioned in the official webstorm docs that the integrated webserver is just very simple and for more complex scenarios you should use an external webserver. I’m personally using gulp-webserver and browser-sync for some stuff where I have to proxy through certain requests to a hana backend. I can also confirm that webpack-dev-server supports this pretty well, even if you’re not using webpack for packaging. But anyway, if you don’t have to proxy requests to the backend you can simply change the path in your index.html to point to the ui5 resources. If you’re using generator-sapui5 it also generates an index.html for you that already points to the proper bower dependency. The code completion works until I reach ODataModel, the last method isn’t showing up in code completion with the ui, model and odata appear. Anyone know how to solve this? Using OpenUI5 1.26.10, and WebStorm 10.0.1. The guy from JetBrains says a lot changed in 9 -> 10 in relation to this topic, so it’s probably due to that. Too bad, since now it’s really broken for OpenUI5. Support for @alias implemented in 10.0.3 so we should get much improved support for OpenUI5. “Check for Updates …” doesn’t show me version 10.0.3, just 10.0.2 only. Is this an upcoming update? Upcoming. It’s in the Issue Tracker, fixed in 10.0.3.
it seems you don’t have an open project. Webstorm doesn’t display the Libraries entry when entering the settings from the initial Screen. So you have to open/create a project first. Then go to the settings dialog as described above. Hi, can you tell me how to deploy a project from webstorm/IDEA to NWAS? I have a project which i cloned from a git repo, i want to do the coding in webstorm and deploy the project to my sap system. Would be super if it is possible. 1) How to integrate a project with desktop Apache Tomcat? If I start it in usual way using Eclipce, any code changes are not affected. I’m trying to set it up using existing guides but they are really hard and complicate. 2) Is there any tools in WebStorm to update changes to NetWeaver or for now I still have to use Eclipce / some transaction? GitHub will be set up at a distant date. Also I tried to use the WebStorm UI5 plugin and unfortunately it looks totally useless. Currently there is no plugin to deploy to NetWeaver, HCP, GateWay or BSP repository. Depending on the project I’m working on, I either share my WebStorm project in an Eclipse workspace (and use the ABAP Team Repository plugin / HCP SDK for deployment to Gateway / HCP respectively), or use the UI5 report to upload to the BSP repository. The current UI5 plugin indeed does not bring anything new, I don’t use it at all. If you use npm as your dependency / built tool: use brower-sync as webserver. Integrate it as a devDependency into your package.json and add a “dev” script to your package.json’s “script” section. Then run the webserver through `npm run dev`. If you’re working in a team you’ll highly appreciate if your project setup is only tied towards a build tool and not additionally towards an IDE. Tying it only to your build tool means usually your team members can use any IDE, be it Eclipse, WebStorm, Atom or whatever the world comes up with tomorrow. Quick and simple. To deploy to SAP, I use report /UI5/UI5_REPOSITORY_LOAD. It’s manual, but I only deploy when I want to QA. Especially the code completion will be a huge benefit. I just tried some things with Webstorm. Does the specified path to the XSD’s still exist? Hi Frank, it is not working because you have your “sap.m” uri attached to “sap.ui.core” xsd, and the “sap.ui.core” uri attached to the “sap.m” xsd in your settings, which is visible in your second image. Your “sap.ui.layout” is set up correctly though. Thanks John, that was exactly it! To work with HCP, destination needs to be configured. Is there any way to configure destination in WebStorm? I think there is no real solution for this problem at the moment. I’ve heard that there is a solution somehow with hosting the project on a local Apache web server which is connected with the SAP CP. But I don’t know who. 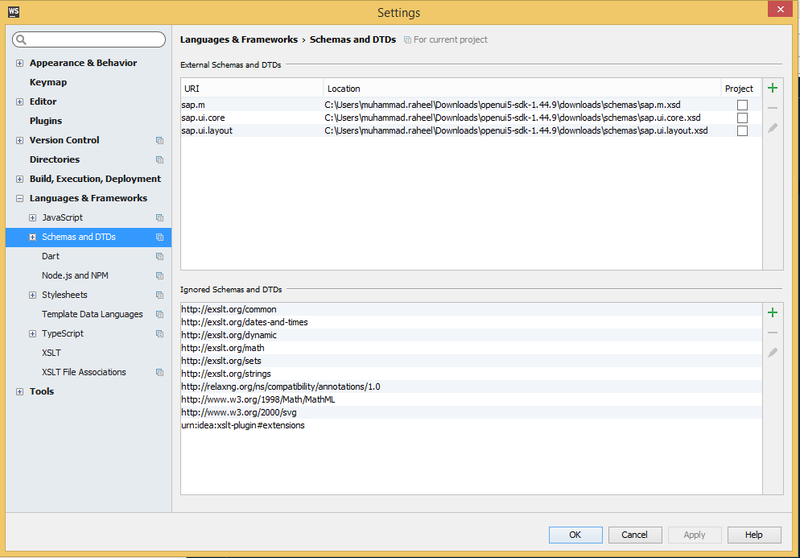 All schema files are further part of the SDK download by now. Thanks for the great article. I implemented this in WebStorm 2017.1.1 and working fine for js libraries but its not working for xml view. Kindly suggest where i could be wrong. This is friggin’ awesome! I always felt the way I described including the schema’s was a bit cumbersome (and incomplete), this improves setting up a project significantly!